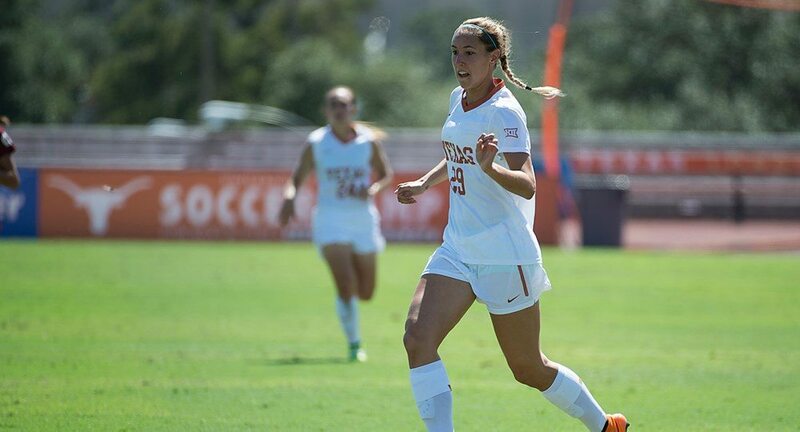 Junior forward Olivia Brook scored twice in the University of Texas soccer team's 3-0 exhibition victory over Texas A&M-Corpus Christi (photo courtesy of texassports.com). AUSTIN, Texas — The University of Texas soccer team got a pair of goals from junior forward Olivia Brook and one from sophomore midfielder Katie Glenn to cruise to a 3-0 exhibition victory Friday over Texas A&M-Corpus Christi at Mike A. Myers Stadium. The Longhorns were at least as dominant on the stat sheet as they were on the scoreboard, enjoying a 21-3 advantage in shots (including a 15-1 margin in the first half), a 9-1 advantage in shots on goal and an 11-0 edge in corner kicks. Texas head coach Angela Kelly said that while there is ample room for improvement, she was pleased with the advanced performance her team produced in its first match of the season. The Longhorns got the only goal they would need in the 14th minute when Glenn converted a feed from Mikayla Flores and buried a shot in the lower left corner of the goal to give UT a 1-0 lead. Brook doubled the margin in the 36th minute to give the Longhorns a 2-0 lead heading into the halftime intermission. UT’s final goal, and Brook’s second score of the game, came when she controlled a loose ball bouncing in the TAMU-CC box and tucked it in to the goal in the 56th minute. Brook said that she enjoyed scoring twice, but said her success was a result of the work she and her teammates have put in as they prepare for the season. “That felt great of course, but I just think that we came together as a team really well tonight. I know that we’ve put in a lot of work. We’ve been working our butts off for the last couple of weeks, and it all came together tonight really well. The Longhorns will kick off the 2016 regular season next Friday, Aug. 19, when they host Seattle at 7 p.m. in a game that will be shown live on the Longhorn Network.